90 volumes of Leo Tolstoy's works were digitized in a project that united volunteers from all over the world. The work to digitize the author’s writings was organized by the crowdsourcing project entitled “All Tolstoy in a Single Click.” This project was launched in June 2013, in cooperation with the Russian company ABBYY. Works from the first three volumes have already been published in the following formats: PDF with a text layer, .fb2 and ePub. The other volumes will be uploaded to www.tolstoy.ru as soon as they are digitized, and anyone will be able to download them for free. The project to digitize the creative heritage of Tolstoy involved volunteers — i.e., ordinary people and non-professionals who love Russian literature. Only two hours after the project started and volunteer recruitment (for checking and proofreading the digitized pages) was announced, the first people began to register on the museum’s website. Just two weeks after the project started, the volunteers had already proofread all 90 volumes, or 46,000 pages. Within the first stage, participants proofread an average of 8.5 volumes, or 3,344 pages a day. The project sparked the interest of many people: In two months, 3,123 volunteers participated in the project. Tolstoy was read by the whole world; there were not only Russians from 252 cities, but also people from Ukraine, Belarus, Kazakhstan, the U.S., Germany, and even from Brazil, Argentina, New Zealand, Peru and Thailand. On the whole, participating in the project were admirers of Tolstoy’s books from 49 countries of the world. “We never expected to receive help on such a large scale,” says the project’s creator, Fekla Tolstaya, who is the great-great-granddaughter of the writer and the director of development at the Leo Tolstoy State Museum. 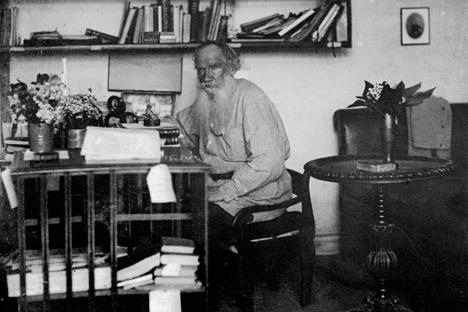 Tolstoy, in his will, asked that all his works be given to the people. Between 1928 and the 1950s, the Soviet Union published a 90-volume collection of his works, which is the most complete selection of all that Tolstoy ever wrote; half of the 90 volumes contain his correspondence and diaries. There is a paradox in studying Tolstoy in Russia. He is, at the same time, known and not known at all. On the one hand, he has always been praised — both in the Soviet years and after the breakup of the Soviet Union — as a literary genius. His books seem to be everywhere: They can be found in any Russian bookstore in the Classic Literature section. His portraits, quotations and epithets are everywhere. “Yet if we look at things more carefully, we see that only 5–7 of his best works are published in the millions of copies,” says Galina Alexeyeva, deputy director of research work at the Yasnaya Polyana Museum-Estate. Religious works by Tolstoy should be mentioned separately — especially the world-famous “What I Believe,” after which Tolstoy was excommunicated. It is amazing to realize that, in the 20 years after perestroika began, this work was never published in Russia — just like all other religious, political and philosophical essays by Tolstoy. This is the goal of the project “All Tolstoy in a Single Click” — to help the people who value Tolstoy’s works learn about all his works, and not only those that are the most popular. This also explains the unexpected surge of interest from volunteers: They confessed that they have never read many of the writer’s works before. It may seem strange that the digital version is based on the 90-volume collection of Tolstoy’s works published back in the Soviet times and supplied with corresponding ideological interpretations. Electronic versions of the 90 volumes of Tolstoy’s works will gradually appear on the website. Now you can read three of the 90 volumes at www.tolstoy.ru, with other books to be posted there over the next several years. The website also features scientifically verified information about the life and work of the writer. It boasts a rich archive of materials published for the first time ever, including photographs, illustrations to Tolstoy’s works, and audio and video recordings.